Deep in the guts of kileleshwa, some place one would call beautiful scenery, and the other dull surrounding, my friend and former classmate has founded and runs an outdoor gym where his friends and he train. 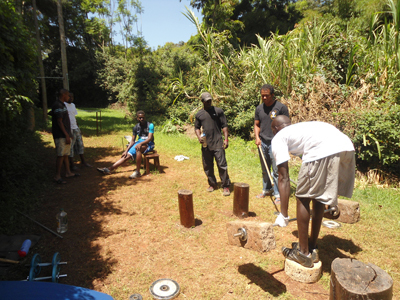 Using improvised equipment that are made from easily available stuff such as construction blocks or cement and ballast and heavy metallic water pipes, the gym runs on completely zero expenses, save for buying things like mats and pretty dumbbells for training women and girls. 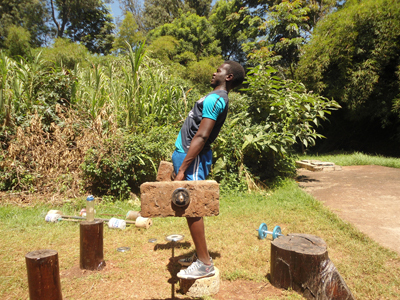 Having had pretty hard times that made him drop out of the university, Victor Ochieng’ never gave up on his passion for body building and fitness. According to me Victor is one of those people that get too passionate about certain things to the point of contagion because looking back at my university life in the earlier years when I still was not sure what I wanted with my life, Victor knew his exact course and that is one of the reasons I stayed motivated. The most peculiar thing about bush gym is the relaxed atmosphere. Put that together with the wide wild range of possibilities an outdoor set up presents and one gets the feeling of invincibility, victory after every training session. The other point of interesting note is the fact that bush gym manages its way around the great hurdle of “expensive” in the fitness world of Nairobi. Looking at the neighborhood in which it is situated, kileleshwa, many gyms charge an arm and a leg for a training session, the same quality, maybe less, that one gets at bush gym, at the lowest expense ever. The gym also takes personal training clients in the early mornings and late evenings. Sad part about bush gym is, as I experienced last time I was there, the scorching sun of the midmorning and afternoon, and of course the possibility of rain that would force one to cancel a training session. Keep all factors constant and its one of the best places to ever train at. Personally I try to go there at least once a week, and if I have the time for it twice or thrice a week.